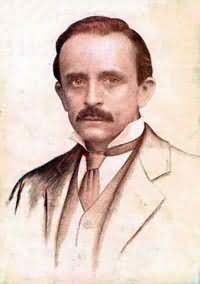 Sir James Matthew Barrie, 1st Baronet, OM (May 9, 1860 – June 19, 1937), more commonly known as J. M. Barrie, was a Scottish novelist and playwright. He is best remembered for his play, Peter Pan, or The Boy Who Would Not Grow Up, about Peter, Wendy and the Lost Boys of Never Never Land. Barrie was a prolific writer in his lifetime, but only Peter Pan has become a timeless classic that continues to delight both children and adults with its theme of never leaving the innocent realm of childhood, where wondrous things exist beyond the day-to-day realities. To be completely human—with its full range of both practical and imaginative potentialities—and to grow up; these are in a sense contradictories. By growing up, by co-operating in social order… one has to curtail the imagination; by doing this one is obliged to give up so much that one becomes an unacceptably diminished person. The story in play or movie form has captivated millions and provided a platform for the emergence of some of the greatest actors of the twentieth century. Born in Kirriemuir, Scotland, Barrie was educated at Dumfries Academy, and the University of Edinburgh. He became a journalist in Nottingham, then London, and turned to writing novels and subsequently plays. He came from a family of humble Scottish weavers and was born the ninth of ten children. When he was six, his brother David, his mother's favorite, died in a skating accident on the eve of his 14th birthday. His mother never recovered from the loss and subsequently J.M. tried to fill the void in her life through a devoted, if not overly enmeshed, relationship with her. In 1897, he wrote a biography of his mother titled simply, Margaret Ogilvy. His close relationship with her is said to be the basis for more than one character in his writings, including "Wendy" in Peter Pan. As a result of his childhood trauma, Barrie suffered from psychogenic dwarfism. As an adult he stood only four feet, teen inches tall. This growth disorder occurs between the ages of two and 15 and is brought on by extreme emotional deprivation or stress. The condition results in decreased growth hormone (GH) secretion, inappropriate height and weight, and immature skeletal age. He was made a baronet in 1913, and granted the Order of Merit for his service during World War I. Barrie died in London, on July 19, 1937, and was buried at Kirriemuir, next to his parents and one sister and a brother. Barrie's early novels take place in the fictional town of "Thrums," based on his birthplace of Kirriemuir. Barrie often wrote dialogue in Scots and his early works drew extensively on his Scottish upbringing. His Thrums novels were hugely successful: Auld Licht Idylls (1888), A Window in Thrums (1889), and The Little Minister (1891). His two "Tommy" novels, Sentimental Tommy (1896) and Tommy and Grizel (1902), added to his oeuvre during this era. After finding success with novels, Barrie then decided to challenge writing for the theater. His first play, Richard Savage closed after one performance. Undeterred, Barrie rebounded with Ibsen's Ghost (1891), a parody of Henrik Ibsen's drama, Ghosts. Ibsen's plays were known for having grim themes and Barrie mocked their pessimism with his lighthearted satire. He turned his popular story, The Little Minister, into a play that premiered in New York City at Frohman's Empire Theater on September 27, 1897. The play, starring Maude Adams, went on to give over three hundred performances, breaking all Broadway records for that time. Other dramatic successes included The Admirable Crichton (1902) and What Every Woman Knows (1908), plays that criticized the rigid and antiquated class structure of Victorian England. Barrie's most famous and enduring work, Peter Pan, was first staged in London on December 27, 1904. Two more classic fantasy plays that he produced were Dear Brutus, which has been compared to Shakespeare's A Midsummer Night's Dream, about a group of people who enter a magic wood; and his final real stage success, Mary Rose (1920) about a ghost mother seeking her lost son on earth. His final play was The Boy David (1936), which dramatized the Biblical story of King Saul and the young David. Like the role of Peter Pan, that of David was played by a woman—Elisabeth Bergner. The Llewelyn Davies family consisted of parents Arthur (1863–1907) and Sylvia, née du Maurier (1866–1910) (daughter of George du Maurier), and their five sons George (1893–1915), John (1894-1959), Peter (1897–1960), Michael (1900–1921), and Nicholas (1903–1980). Barrie became acquainted with the family around 1898, after meeting George and Jack with their nanny Mary Hodgson in London's Kensington Gardens. Barrie, who lived nearby would often walk his St. Bernard dog in the park. He then met the boys' mother at a cocktail party and his continued involvement with the family, which has become legendary, provided inspiration for his play, Peter Pan. Eventually—in a story befitting one of Barrie's own—he became a surrogate father to the boys. When they were orphaned—both of their parents died at fairly young ages of natural causes—he became their guardian. Sylvia Llewelyn Davies' specified in her will that Barrie be trustee and guardian to the boys, along with her mother, her brother Guy Du-Maurier, and her husband's brother, Arthur Llewelyn Davies. Peter Pan went on to become one of the most culturally iconic myth-figures of the twentieth Century. He represents the eternally young and along with his fairy friend, "Tinkerbell," he introduces the Darling siblings, Wendy and John, to a world in which adult rules are non-existent and children's imaginations are able to have free reign. Every good yarn must pit good against evil and Peter Pan is no exception. The infamous Captain Hook and his band of villainous pirates forces the children to leave "Never Never Land" and return to the their London home—and back to the stark reality of growing up. In 1911, Barrie published a narrative adaption of the play, called "Peter and Wendy." The novel's epilogue makes clear the ultimate destiny chosen by Wendy who as an adult meets Peter Pan again. A New York Times reviewer said that the book is full of "the kind of lovely things one dreams about," and an Anthenaeum critic contended that the book "will survive even the play." Barrie was part of a literary circle that included many notable writers of the day including Robert Louis Stevenson, George Bernard Shaw (who once participated in a Western that Barrie scripted and filmed), and Jerome K. Jerome, who introduced Barrie to his wife. H.G. Wells was a friend and neighbor of many years. J.M. Barrie met Thomas Hardy while the Welsh author was visiting London—both writers shared a fascination with ghosts and spirits. Other literati of the time, such as Arthur Conan Doyle, G. K. Chesterton, and A.A. Milne occasionally played cricket on a team formed by Barrie. Barrie also befriended Antarctic explorer Robert Falcon Scott and was a recipient of one of the letters that Scott wrote in the final hours of his life. Another close friend of Barrie's was theater producer Charles Frohman. In 1915, Barrie asked him to come to London to help out a faltering production. Frohman ignored warnings and sailed on the Lusitania. When the ship was torpedoed on May 7, 1915, Frohman is said to have met his end, intoning the last line in Peter Pan: "Why fear death, it's the greatest adventure of all." 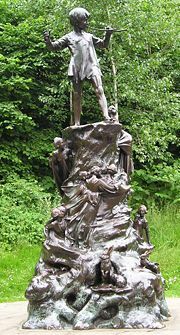 For his epitaph Frohman asked that he be remembered as "The man who gave Peter Pan to the world and Chantecler (a play by French dramatist Edmund Rostand) to America." In 1911, the book, Peter Pan and Wendy was hailed as Barrie's masterpiece. Soon after its publication, it was "recommended for the imaginative, the eternally youthful and the pure in heart," by one reviewer. However, speculation about Barrie's sexuality caused later critics of the Victorian era to dismiss Peter Pan as "one of the most fragmented and troubled works in the history of children's literature." One biographer has said of Barrie's works, "Barrie owed his popularity to a peculiar alloy of raw, unashamed sentimentality and haunting bitterness, which eventually allowed him to become the voice and imagination of a world which was slowly and inexorably losing faith in Victorian myths…"
Barrie himself said of his children's writing, "Children have the strangest adventures without being troubled by them." In August 2004, Great Britain's leading children's hospital, Great Ormond Street Hospital in London, which holds the copyright to Peter Pan, conducted a world wide search for an author to write the official sequel. English children's author Geraldine McCaughrean was chosen and her book, titled Peter Pan in Scarlet, was published in 2006. The 1978 BBC's award-winning miniseries Lost Boys by Andrew Birkin, (also titled J.M. Barrie and the Lost Boys) starring Ian Holm as Barrie and Ann Bell as Sylvia is considered factual. It addresses the issue of Barrie's affection for the Davies boys. The DVD is available in both the UK and U.S.
A semi-fictional movie about his relationship with the family, Finding Neverland, was released in November 2004, starring Johnny Depp as Barrie and Kate Winslet as Sylvia Llewelyn Davies. ↑ Anthony Lane, Lost Boys. Retrieved June 20, 2007. ↑ Questioning the Story. Chasingthefrog.com. Retrieved June 20, 2007. ↑ "James Matthew Barrie, Sir." Encyclopedia of World Biography, 2nd ed. 17 Vols (Gale Research, 1998). ↑ Michelle Powell, An Awfully Big Adventure..amrep.org. Retrieved June 20, 2007. ↑ "James Matthew Barrie" Contemporary Authors Online (Gale Research, 2003). ↑ Lisa Chaney. Hide-and-Seek with Angels—A Life of J.M. Barrie. (London: Arrow Books, 2005). ↑ Charles Frohman..Answers.com. Retrieved June 19, 2007. ↑ Anita Silvey, ed., Children's Books and Their Creators. (New York: Houghton Mifflin Co., 1995). ↑ "James Matthew Barrie, (Sir)." St. James Guide to Fantasy Writers. (St. James Press, 1996. ISBN 1558622055 ). "James Matthew Barrie" Contemporary Authors Online Gale Research 2003. Reproduced in Biography Resource Center. Farmington Hills, Mich.: Thomson Gale. 2003. "James Matthew Barrie, (Sir)." St. James Guide to Fantasy Writers. St. James Press 1996. ISBN 1558622055. Reproduced in Biography Resource Center. Farmington Hills, Mich.: Thomson Gale. 2007. "James Matthew Barrie, Sir." Encyclopedia of World Biography, 2nd ed. 17 Vols. Gale Research, 1998. Reproduced in Biography Resource Center. Farmington Hills, Mich.: Thomson Gale. 2007. Stokes, Sewell. "The Story of J.M.B." in Theatre Arts, Vol. XXV No. 11: 845-848. J. M. Barrie Project Gutenberg. "Barrie's official website", J.M. Barrie.co.uk. Munoz, Karen. 2001. I Won't Grow Up: The Causes of Psychogenic Dwarfism serendip.brynmawr.edu. Lane, Anthony, "Why J.M. Barrie Created Peter Pan", The New Yorker, 2004. Kellaway, Kate. 2006. The Ascent of Pan books.guardian.co.uk. History of "J. M. Barrie"
This page was last modified on 12 March 2018, at 00:00.